"The hotel needed some refurbishing, but the staff was friendly and polite. A housekeeper banged on the door at 8 AM; I complained, and the employees were apologetic. I'd stay here again.2016-09-24"
"Nice, clean room. The hotel clerks were friendly, and breakfast was great.2016-06-02"
"The hotel room was warm and comfortable, and all the employees were friendly and extremely helpful. Great place to stay.2016-02-12"
"I was disappointed to be given a smoking room. Breakfast was poor considering the price of the room. Find another hotel.2015-09-22"
"Convenient to Drexel Medical School and restaurants. Reasonable rate for good accommodations. The staff was polite and attentive. 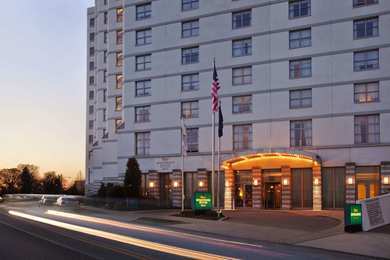 Don't hesitate to book here.2015-02-17"
Learn more about Philadelphia Hotels & Motels in our Philadelphia Hotels Guide.